Dyna-Ski Boats has had some inquiries about Bimini Tops on our boats. It seems that the first one of anything we do is difficult. My heart and head told me not to build a demo Dyna-Ski with a bimini top. Better to have a customer that wants one to do the leg work and report on how it turns out. Rod Penner who just repowered his Dyna-Ski boat with our help decided he need a bimini top and ran with the ball! Rod lives on Lake Dyna-Ski as I call it. Lake North in South Bend, Nebraska is a hot bed for Dyna-Ski Boats. 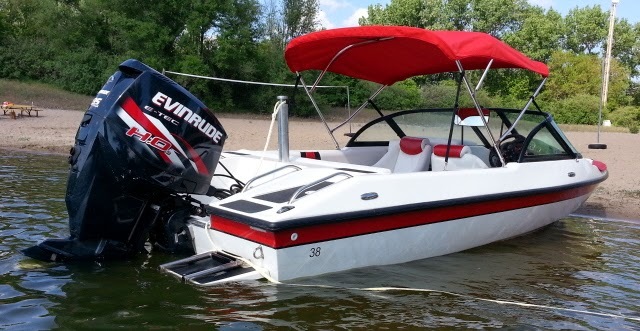 His first motor was the Evinrude V-4 130 E-Tec. The new motor is a Evinrude V-6 135 HO. While it is only 5 more horsepower I am looking forward to a complete report on how much of a change this motor is from a fellow that pulls a lot of water skiers all summer long. You know the boat gets lots of use as he skied the decals off of the boat! I will have to get him some new decals. We do a lot of our skiing in the late morning to early afternoon the high sun overhead can create problems both from a heat standpoint and exposure to cancer causing UV rays. The best solution for those problems is a bimini top, so I decided to do some research. I looked locally, searched the big online retailers, and searched bimini tops using my favorite online search engine. First off, I have no financial interest in any of the bimini top sellers, and the opinions expressed are mine and mine alone, and your results may be different than mine. After looking at many options I chose to purchase my top from ANP inc from Ontario, Canada. The reasons I chose ANP are 1) It is a high quality top with double wall aluminum tubing in the main frame. 2) The price was among the best I found anywhere for a comparable top. 3) They offer a nice variety of options as far as size, hardware, and fabric. I chose the 5' length, 30-36” height, with sunbrella fabric in Jockey Red, which matches the red trim on my boat perfectly. I opted to update the hardware from the standard nylon to stainless steel, but I'm not sure this is a necessary upgrade as I have seen many older tops with the nylon hardware and it seems to hold up well. From Pete: Dyna-Ski Boats uses Sunbrella for our boat covers. When I received the top it was all I expected. The instructions are clear and will take you through every step of assembly in a clear and concise manner. The top comes 36” tall which looked a bit too tall for my liking, but with the use of a jig saw with a hack saw blade I was easily able to adjust that to 32”. Total time from beginning of assembly to completion of installation was about 90 minutes, but your time may vary based on your degree of mechanical aptitude. So there you have it. Do it yourself and save money! Dyna-Ski Boats will continue to offer Bimini Tops as an option and we may follow Rod's lead and order them from ANP ourselves as it seems easy and turns out well!